The New Message is here to give humanity great promise and strength—the power of Knowledge that God has placed within each person as the great endowment, an endowment that is waiting to be discovered. Humanity has not yet discovered its greater powers, its greater strength, its greater integrity and its greater ethical foundation. It is still groveling, like a primitive race, driven by greed and avarice, hatred and condemnation. It is still primitive in what it prescribes and what it adheres to. But this does not deny the fact that humanity has greater strengths and greater powers that have yet to be discovered and developed. The Creator of all life has sent a New Message into the world to prepare humanity for the Great Waves of change that are coming to the world and to prepare humanity for its encounter with a universe full of intelligent life. But this preparation also requires that humanity recognize and cultivate its greater strengths and its greater integrity. Humanity cannot be taught or prepared all at once, for the instruction happens at the level of the individual, at the level of the person. To bring an individual into awareness of that individual’s greater strengths, greater powers and greater integrity is where the seeds will be planted and where humanity’s promise resides. Therefore, do not think of what all people should do, or you will always be disappointed and discouraged. Think instead of what is before you. Your societies and cultures may only want you to be a pacified consumer, a pacified worker, a member of the group, a subscriber to the culture’s values and priorities. But you have a greater promise in life, a greater promise that is assured because it is part of your deeper nature. In culture, your deeper nature is forgotten and overlooked and, in some cases, denied entirely. But you cannot deny your deeper nature forever, for it lives within you beyond the reach of culture, beyond the reach of corruption, beyond the reach of manipulation and deception. That is why it is your greater strength and holds for you your greatest abilities and indeed your greater purpose for coming into the world. What was reserved previously only for the elite, for the adepts, must now become an open door for you and for other peoples of the world. For the world is facing its greatest trials, its greatest dangers. Humanity is unprepared for the Great Waves of change. Humanity is ignorant and foolish regarding its views and attitudes toward the prospect of intelligent life in the universe. So the promise of humanity is the promise of the individual, the awakening of the person. It is this that will give humanity a greater core strength and a greater possibility to exercise real wisdom in the face of such an unpredictable and uncertain future. For a person to respond to God’s Revelation, they must recognize at the outset that they cannot fulfill themselves given the usual habits and diversions and enjoyments that people around them are so deeply invested in. They must realize they have a greater need and a greater responsibility in life. This will be demonstrated at the outset by their suffering and their discouragement with the world around them as they gradually lose interest in the games and hobbies of people around them because they have a deeper need that is now emerging. If they have satisfied the needs of the body through food, clothing, shelter and security; if they have satisfied the needs of the mind through the availability of education and opportunity, then the greater need will begin to arise within them—the need of the soul—which can only be fulfilled by recognizing, accepting and fulfilling your greater purpose for coming here, which is something that resides entirely beyond the realm and the reach of the intellect. You cannot figure it out, but you can and must experience it. It is waiting to be discovered. To be a person of the New Message, you must realize that humanity is entering a new era and a tremendously powerful and uncertain threshold. You cannot simply rely upon ancient teachings or ancient prescriptions or ancient prophecies now to guide you into a new future. For the world has changed and is changing rapidly, but people have not changed with it and do not see the need to change. The person of the New Message then must recognize that they are standing at the threshold of a monumental shift in the reality of the world, in the conditions of life here and in the discovery that your isolation in the universe is over, and you will never have it again. The pressure here will be great, but it is pressure for a purpose. It is leading you to the most profound discovery you can ever have in life, and that is the discovery of the power and presence of Knowledge within you—a deeper mind, a greater mind, a mind that is committed and focused, a mind that is not distracted or dissuaded by the world, a mind that is pure and uncorrupted, a mind that has been undefiled by the world in all of its inducements and tragedies. The New Revelation speaks of this because humanity must gain access to its greater strengths, greater powers and greater integrity. If it does not do this, it will fail in the face of the Great Waves of change. And it will be overtaken through guile and deception by forces from the universe who are here to take advantage of a weak and divided humanity. Because of the great danger for human civilization and for the well-being and freedom of the human family, the Creator of all life has sent a New Message into the world, a Revelation as great as any of the Revelations that have been sent here. It is here in a pure form, uncorrupted by governments, undefiled by ambitious individuals, unwedded to culture and politics and the lower intentions of humanity. The person of the New Message realizes they are living at a time of Revelation, a time where this Revelation is so greatly needed as people all around them, even in positions of power in government, seem to be unresponsive to the signs of the world and to the emergence of great change. The individual’s ability to undergo the preparation, to gain access to the power of Knowledge and to follow this faithfully—without trying to control or manipulate this greater intelligence—is a tremendous challenge and opportunity. But it represents redemption for the individual because it is through Knowledge that you reconnect with God, that you rediscover that you have a greater purpose in life and are able to follow the steps of its revelation—a personal revelation. Here you realize that you are a pioneer. You are doing something new. You are at the very outset of a great movement, a great shift. As a pioneer, you will have to face the loneliness and the lack of recognition from others. You will have to build your own strength and bond closely with others who are responding to the Revelation. Here you realize that you do not have an answer for the future, and you do not have an answer for your life, for your answers are all the answers that culture has given you. Even the answers that you feel you have created are still the answers that others have provided. But there is only one answer, and that is to prepare for a Great Waves world. It is to prepare your life and your mind to serve at a higher capacity. It is to undergo a great preparation that you did not invent for yourself, but which has been given to you through grace and through providence. Here you break the chains of addiction, and the need for approval, and the adherence to culture and to the dictates of your nation, to bond and unite with a greater power and force that is the Source of all life in the universe. You do this with humility, and you do not proclaim yourself, for you know the greater power is not yours to own or to use or to control. But you are blessed to receive it and allow it to reshape your life and your direction so that real fulfillment and satisfaction may become available to you. You prepare then to be a man or a woman of Knowledge—not just for your own redemption and fulfillment, but to play your part at a time of great transition. You know not the meaning of this or the importance of this. Perhaps you will think you will be a great leader, but very few people will be great leaders. You will just play a part that will take shape and form as you proceed and as your relationships with others gain greater clarification and greater honesty. You are a person of a New Revelation, and you become unbound and unhindered by the past, for you are the seed bearer of the future. You are carrying the vessel of the future. It is not enough to merely live for the moment, for that is only half of the meaning of life. You must also prepare for the future, and only Knowledge within you knows what that future will be and how you can prepare for it wisely, effectively and safely. The way is actually quite simple, but because it resides beyond the realm of the intellect, people can stumble and become very confused regarding it, trying to match its reality with their own current beliefs and attitudes. Of course your current beliefs and attitudes are the creation of culture and often the product of fear. They have nothing to do with the reality of your greater life. They are only the residue of the past and of an old identity, which you still carry and must learn to outgrow. This outgrowing of identity is a natural thing entirely. It is like outgrowing adolescence for adulthood. As an adolescent, you identify with your age and your compatriots, and you are swayed by their values and their pursuits. But when you become an adult, your priorities change. You seek things that have greater meaning and value, and you assume greater responsibilities in life. So it is here with outgrowing the old personal identity. You are assuming greater responsibilities. You are seeking greater meaning. The old pursuits are seen as lacking and insufficient for your deeper needs. This is growing up spiritually. This is what it means to continue to fulfill the hierarchy of needs within yourself. It is this that reunites you with the world and with those who sent you here. It is here that you find your greatest fulfillment within your own integrity, within the quality of relationships that will now begin to come to you and with the sense of meaning that becomes pervasive in your life. What was fleeting before now becomes more central to your focus. Spiritual practice is not merely a form of stress release. It becomes now the central power building, the central focus of your activities, so that you bring your spiritual practice into everything that you do because it is relevant to everything that you do, and it will assist you and bring clarity in everything that you do. Here there is no real sacrifice. You simply outgrow things that are seen to be lacking or even foolish, which before were so important to you. Most people never grow up spiritually, so they remain in a state of childhood or adolescence spiritually. Even though they have gray hair and become aged physically, they never really become grown up spiritually. But the process of growth is the same—the outgrowing of the old, the emergence of the new, the growing pains of becoming a more responsible, more efficacious person, and the great opportunity of experiencing relationships at the level of higher purpose in life, which is something that is largely beyond the reach of others who have not undergone this greater development. A person of the New Message realizes they are part of something greater that is emerging. They do not need to see the conclusion or the outcome, for that is beyond their reach and beyond the range of their vision. It is not their responsibility to assure an outcome, but to play their part in moving humanity in a positive direction. And how could humanity move in a positive direction without the great assistance that the Creator of all life is providing? It is tragically evident that humanity cannot do this for itself, or will not do this, whatever the case may be. People pray to God for assistance, for opportunity, for deliverance, for escape from pain and suffering, for renewal, for rejuvenation. But when the Message comes in such a great form, they cannot see it, they do not respond, or they deny it because it does not meet their expectations or their previous beliefs. If you really want God to help you, you had better be ready to change your life. God will help you completely. If you are not sure you want this, then perhaps you should withhold your prayers and affirmations. 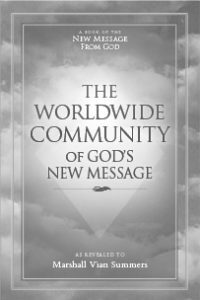 The people of the New Message must assist the Messenger while he is still in the world. His task is overwhelming. It is far beyond what one person could ever do. They must bear witness to this. They must represent this. They must have the courage to be part of the Revelation and not simply its observers or its audience. The power of the Revelation to restore humanity and to prepare humanity will be based upon the actions of many people. The Revelation is pure. It is uncorrupted. It has been given completely. The Messenger has not perished with the Message half delivered. The Creator of all life made sure of this. Everything is in place. But the Revelation speaks to a different reality within people. It does not pander to their intellect or their intellectual pride. It does not support their prejudices and their incomplete or incorrect thinking. It is not bound by human preference or human will, and so it seems remarkable but confounding, new and different, but somehow ancient and timeless. The person of the New Message must be part of the New Message. They cannot simply be a consumer who will steal it and run away and try to use it to build wealth or personal power or personal advantage. Like thieves in the night, they will steal it and claim for themselves its power and its privilege and its authorship. You will see the attempt at this, yes, because humanity is far too corrupt as a whole to deal with something this pure, and that is why the individual is the focus and not the collective masses of people. It is by people learning and living the New Message that they will be able to transfer and translate its power and wisdom into their families, their communities, their nations, their religions, everything—creating a quantum shift in human perception that will happen almost invisibly over time. Of course. It will be common sense at that point. But at this moment, it seems fantastic and impossible. How could it be? Because people are still thinking in a primitive way. They are still thinking like they are isolated in the universe. They are not thinking ahead. They do not see that humanity has already ravaged the world to such an extent that it will barely be able to provide for them in the future, thus creating the Great Waves of change. The promise is in the individual. This has always been the case. All new revelations, all new improvements, innovations, great steps in science, commerce and social justice have always been furthered by individuals who were inspired and committed to their service. This is how all the races in the universe are advanced and have promise. For the person of the New Message, they have a great responsibility here, perhaps greater than anything they have ever considered for themselves. Part of them still wants to go off and be happy and carefree somewhere, to live a kind of idyllic, irresponsible life. But deeper within them there is emerging a stronger power and a deeper voice and a sense of commitment and direction that are now becoming their framework and their context. They are connected to the future. They are connected to the Greater Community. They are connected to [their] time and to the great times to come. They are beginning to respond as if they were actually sent to the world to achieve something specific in concert with certain individuals. They are actually beginning to think and feel like immortal beings that are here to provide service in a temporary and troubled environment. But to reach this awareness and the strength of this reality requires a tremendous commitment and preparation. You cannot be halfhearted in this matter. You cannot be impatient or manipulative or driven by your preferences, or you will not even be able to begin. You will be cast aside at the first challenge or impediment, the first discouragement, when you find out the people around you that you thought were so friendly and close to you really have no clue or have no interest in these matters and will turn against you should you proclaim yourself. Here you realize you have a choice. You will either follow the emerging power of Knowledge, however mysterious, or you will conform to the needs and the preferences of your family or friends. Many people fail at this point, merging back into the amnesia of culture, to the addiction of culture, to the manipulation of culture. They awoke briefly, only to be subsumed by the powers in the mental environment around them, pulling them back in—into confusion, into irresponsibility, into fantasy. You must now be concerned with your own calling and development and the development of others around you whom you may know, who are able to respond to a New Revelation in life. You cannot get up this mountain if you are waiting for others. You yourself must get up this mountain, even if your greatest friends cannot go. You will do more for the world and for them if you can ascend and make this journey than you could ever do by staying behind and being encouraging. There is so much wisdom and clarity to gain along the way. Much of it you cannot see at this moment, but it is awaiting you in your journey. You cannot learn these things unless you take this journey. You cannot learn them as precepts or as ideas, for you will not be able to embody them, follow them and demonstrate them. The person of the New Message is part of the New Message as a contributor, without trying to define your role or claim powers or positions for yourself. This will require a great deal of restraint on your part, for all these tendencies are still within you. The seeds of evil, the seeds of greed, the seeds of deception, the seeds of self-deception are all there. Many of them are quite active at this moment. So you will have to restrain these things and turn to Knowledge and ask the assistance of others when that becomes necessary. For you do not want to lose this calling. You have come this far. You do not want to fail. You have already moved beyond the obsessions of culture to a great extent. You do not want to fail in this pursuit, the greatest opportunity you could ever have—you who are chosen and lucky and so, so fortunate to be amongst the first to receive a New Message from God. Do you realize what you have before you? Do you have any idea? In your self-deprecation, can you see what is before you? God has given you a way, a path out of the jungle, the hopeless maze of human confusion and human compromise. Therefore, take heart. Stay with your preparation and practice. Let the signs of the world tell you what is coming, and let the signs within yourself moderate your extreme behaviors and your harsh criticisms—without taking anything away from the self-correction that you must bring to bear in your thinking, your assumptions and your behavior. A wise teacher does not punish the student, but only offers firm correction. This is how you must be with yourself. This is how a wise and loving parent is with their young innocent child. You are like a child now in developing a Greater Community awareness and discovering the power of Knowledge. You are at the early stages, and there is a great road ahead of you. Finally, you have purpose, meaning and direction. But you must stay with this and not be waylaid by the obstacles, the distractions and the old ideas and beliefs that cloud your mind, where you lose track of the trail up the mountain. Do not be seduced by the beautiful places to reside along the way, for you have a destiny and a journey to take. This is how God will redeem you, in a way that you could never redeem yourself.